The White House plans to nominate a man who considers Steve Bannon a conservative luminary to lead the Broadcasting Board of Governors, an independent federal agency that oversees government-backed media. According to CNN, the BBG is considered American’s “largest public diplomacy program” with an audience of 278 million people across 100 countries worldwide. The nominee is Michael Pack, former head of the conservative Claremont Institute and publisher the Claremont Review of Books, which Politico notes “has been called the ‘academic home of Trumpism’ by the Chronicle of Higher Education.” He’s also a fan of white nationalist Steve Bannon, celebrating him as a pathbreaking documentary filmmaker in an op-ed last March. 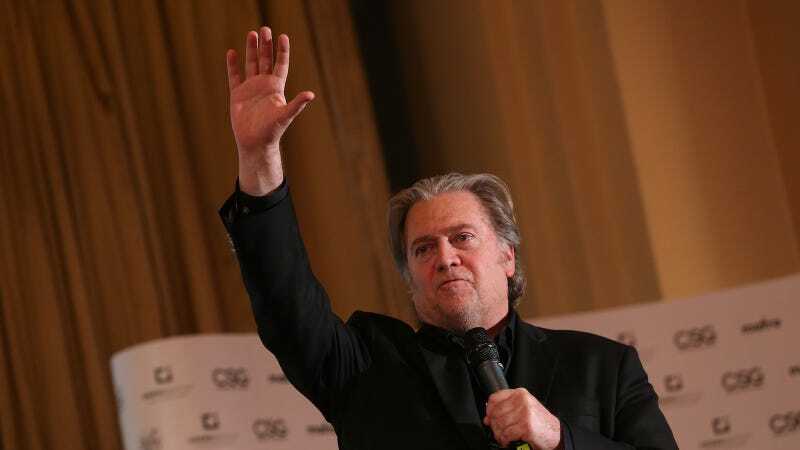 A Trump appointee already working in the BBG, Jeffrey Scott Shapiro, a former investigative reporter who has ties to Bannon, has told colleagues that his goal is to turn the agency into a “Bannon legacy,” according to three sources within or familiar with the agency. There are very few safeguards in place to stop Pack from turning the network into a full-on Trump propaganda machine: The agency disbanded its bipartisan board in the weeks before Donald Trump took office, removing a layer between the president’s office and the agency. In 2016, Politico noted that with the BBG, “Trump is finally getting his Trump TV—financed by taxpayers to the tune of $800 million per year.” If Pack is confirmed, Trump TV by another name could soon follow.